Posted on Mon, Mar 5, 2012 : 9:52 a.m.
Pittsfield Township firefighter John Decaro tapes off a perimeter around the entrance of Kroger, located off Carpenter Road at Packard, after a gas leak was reported and the store was evacuated on Monday morning. 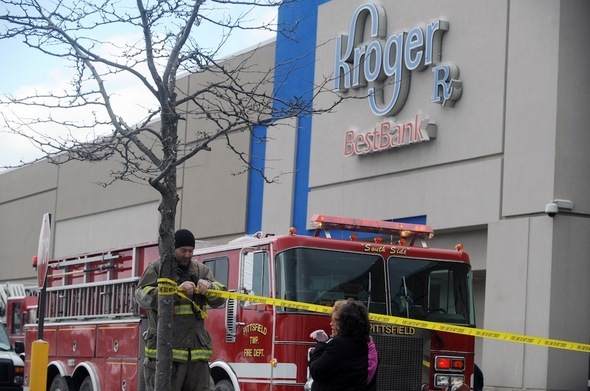 The Kroger grocery store on Carpenter Road in Pittsfield Township reopened around 11:30 Monday morning after a strong smell of gas prompted an evacuation earlier in the day. Fire Chief Sean Gleason said people noticed a strong odor of gas inside and outside the store about 9:30 am. Monday. DTE Energy crews responded, shut off all the gas appliances and checked for a gas leak but found no problems, he said. The gas smell dissipated quickly and no other businesses had to be evacuated, Gleason said. DTE crews were still at the store at 11:40 a.m.
Roger Quinn was shopping at the store near the intersection at Carpenter and Packard roads when the order to evacuate was made. The gas odor was strong, he said. Gleason said such an odor can occur with no evidence of a problem. "Sometimes you just get a buildup of gas," he said. Mon, Mar 5, 2012 : 9:20 p.m. I reported a gas leak when I was walking with a friend in the Pittsfield Blvd area some twelve years ago. The fire Dept told me that the gas lines were so old they were leaking underground. He also showed me the brown grass where the gas was coming up, and it basically ran down next to the sidewalk all the way down. He said it looks like it has been leaking for sometime now. Now that strip mall where Kroger is now has been there for a long time too, I bet it is coming from under ground. A very expensive fix, but I'm sure insurance will cover it. It's better then a bunch of law suits. Tue, Mar 6, 2012 : 4:43 p.m.
just wondering: cannot fire marshals compel gas companies and/or property owners to fix such leaks? What you describe is a very dangerous condition. And - do you know how quickly the original leak you mention was fixed? Mon, Mar 5, 2012 : 8:31 p.m.
this is not good at all.i'll bet the people had a hissy fit. Tue, Mar 6, 2012 : 7:54 p.m.
Actually they all went outside to have a smoking fit. Mon, Mar 5, 2012 : 8:21 p.m.
&quot;Gleason said such an odor can occur with no evidence of a problem. &quot;Sometimes you just get a buildup of gas,&quot; he said.' how does that happen? The natural gas we smell is supposed to be in a closed system isn't it? Its contained in pipes to the point of use. a stove, furnace etc. How does it &quot;build up&quot; outside that closed system? Mon, Mar 5, 2012 : 9:22 p.m.
Mon, Mar 5, 2012 : 6:47 p.m.
Gleason said such an odor can occur with no evidence of a problem. &quot;Sometimes you just get a buildup of gas,&quot; he said.&quot; So...Kroger farted? O so that is what that smell was. I thought I stepped in something. Mon, Mar 5, 2012 : 8:56 p.m.
No... I did and I apologize, but, after all, I am an old lady, ya know. Mon, Mar 5, 2012 : 5:02 p.m.
so the gas dissipated &quot;on its own&quot;prior to DTE finding a cause/source? I gotta pick up a few things later today. I guess I'll forgo my Kroger gas points and go to Hillers instead. Hillers has better boneless, skinless chicken breasts anyway. Tue, Mar 6, 2012 : 2:21 a.m.
You csan get em in bulk and frozen at Gordon's just down the road. Mon, Mar 5, 2012 : 9:18 p.m.
Mon, Mar 5, 2012 : 3:07 p.m.
Yikes...that's &quot;my&quot; Kroger. I hope all are safe.